Memorial Day weekend is universally recognized as the start of summer. Tradition allows that we can start wearing white, gather family and friends for barbecue, and, for those so inclined, go camping. For the past many years it’s also been the start of the Museum of Family Camping’s season. 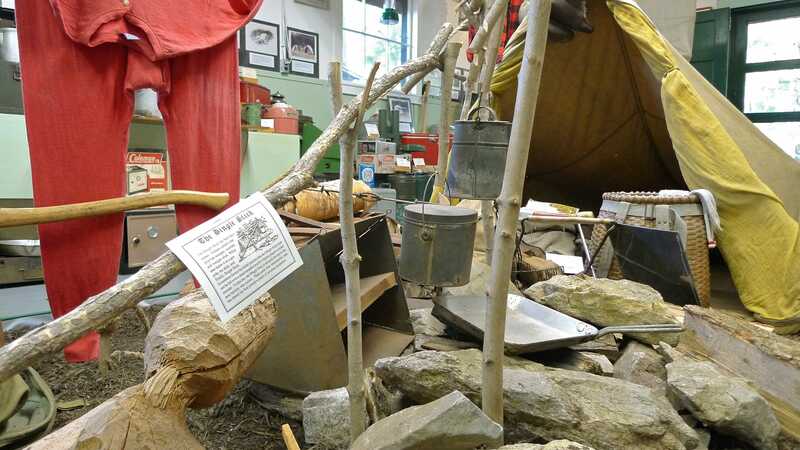 The interior displays at the Museum of Family Camping celebrated many generations of camping history. My docent made much of the dingle stick (the vertical stick that holds the cooking tin); good manners demanded they be left at the camp site for the next camper. The museum told the story of camping starting in the Great Depression. Modern Era migrations such as that depicted in The Grapes of Wrath set the stage for leisure time camping. Proto handymen crafted campers from kits and plans, putting to their own purpose the newly popular innovations of their day: automobiles and plywood. Yes, plywood. It’s clearly an essential component in a camper. Judging by the outdoor displays, bumper stickers appear to be a structurally significant part of campers after mid 1960. The generations of RV development could be seen in the well maintained collection of campers on the museum’s front lawn. Docents, who lived on site in their own campers, would walk visitors though the outdoor display and encourage them to note the emergence of different materials and changing style over the decades. An early Sears camper offered little more than a dry floor on which to lay out the family’s bedrolls, but amenities developed quickly. Lacquered plywood tables appeared, then gave way formica sheathed kitchens with small, but serviceable built-in in appliances. Tupperware was significant. This diorama of an ideal American campground was once featured at a camping tradeshow in the 1960s and had been on display at the Museum of Family Camping. Jessamyn visited during it’s final days last year and returned with a story that it was set to close permanently. The museum’s web site says nothing of the closure and the listed phone number still rings. Nobody answers there, but calls elsewhere confirmed my fears: the museum really won’t be opening this year. No news was immediately available about what may happen to the museum in the future, but I was told to watch the web site.